There are so many ways to praise Moss that it’s difficult to know where to start. We could talk about its stunning environment design, which utilises the depth and scale afforded by VR to convey a sense of wonder that a standard game could never achieve. We could talk about its splendidly spun fairytale that blends first-person and third-person storytelling both narratively and mechanically. We could talk about its delightfully tactile puzzles, which have you physically reach into the game world and manipulate objects while controlling your character at the same time. But I think the best place to start is with how Moss lets you high-five a mouse. Whenever you complete one of Moss’ more complicated puzzles, its diminutive protagonist Quill will hold up a paw. Using the touch controllers, you can reach out with your own hand in response, which Quill will gaily slap, uttering a squeaky 'Woo-hoo!' as she does so. It’s a tiny detail that serves no functional purpose, but it also encapsulates everything that Moss is built to do. Namely, it wants you to build a relationship with a fictional character in a way that wouldn’t be possible in any medium other than VR. 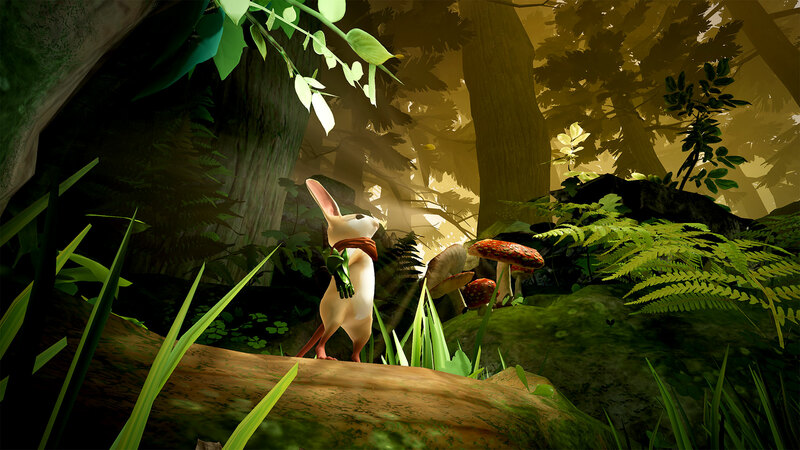 Hence, while the plot of Moss is a straightforward affair revolving around Quill’s search for her missing uncle, the actual story is about the bond between Quill and yourself. The game even frames you as character in its tale. You are a Reader, a god-like being who resembles Mister No-Face in the Studio Ghibli film Spirited Away. Quill accidentally summons you at the game’s commencement, and you’re empowered with the ability to manipulate certain objects in the world, blocks, levers, and gigantic chains that you pull out from the screen. 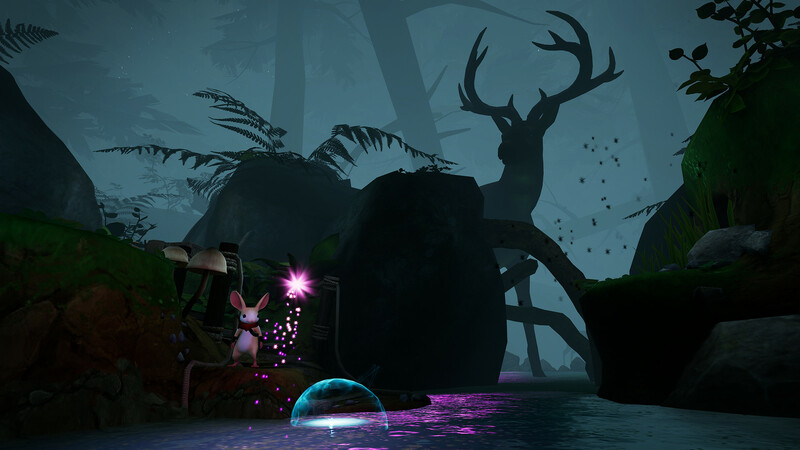 What you essentially have is a hybrid of static-screen platformer and touchy-feely VR game. 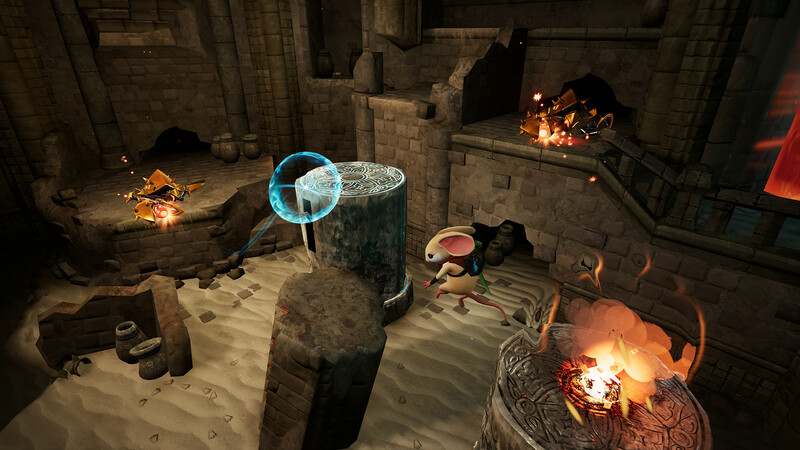 You control Quill using the analogue stick and buttons on the Oculus Touch controller, and manipulate objects by pulling and pushing them with your virtual hands (which in the game are orbs rather than actual hands, presumably a consequence of the game’s original debut on PSVR earlier this year). Mechanically it’s a fairly basic blend of platforming and melee combat, with most of the game’s complexity stemming from the puzzles you have to solve. 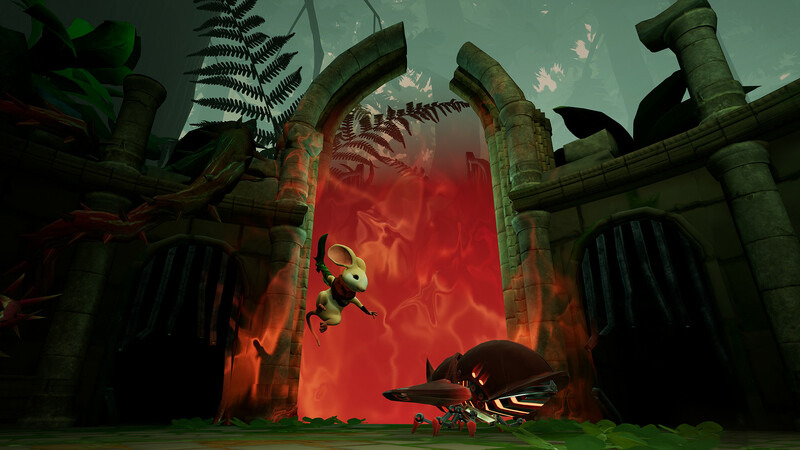 Initially, these are very straightforward, mostly centred around creating a path for Quill to move across, but they become more complicated once the game starts introducing its beetle-like enemies. These can be defeated with a few swipes of Quill’s tiny sword, but sometimes you need them for other purposes. Many of these opponents can be “possessed” by the Reader by grabbing them with your virtual hands, then dragging them around to move them. 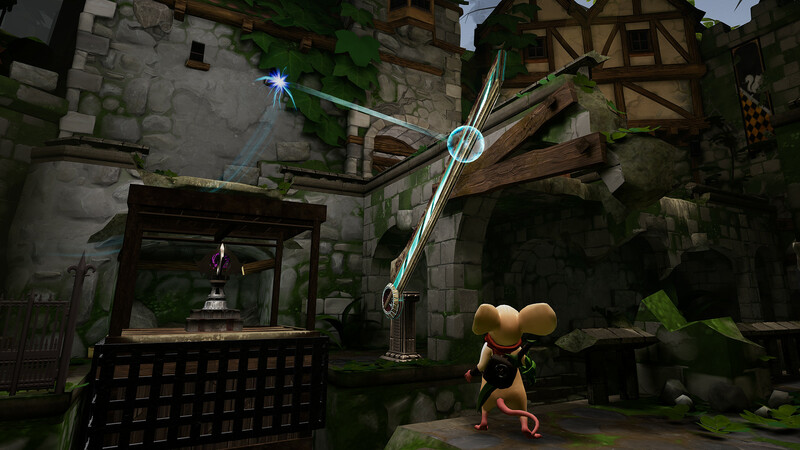 The game’s more elaborate puzzles involve manipulating these creatures while also moving Quill into the correct positions to solve the conundrum, a combination that will test your spatial awareness and your ability to multitask. What makes Moss so engaging is the detail that developer Polyarc has baked into the game world. The Kingdom of Moss is essentially a fantasy land in miniature that exists within a much larger, full-scale world. One moment you’re looking down at a tiny, chocolate box village built amidst the grass and foliage of the forest floor. Then you look up, and up, and up at the towering tree canopy above you. It’s an incredible demonstration of how well VR communicates scale. This isn’t to say the Kingdom itself feels tiny. It has its own level of grandeur, featuring sprawling stone-built towns and towering castle spires. But all of it is contained within this much, much larger world that surprises you every time the game reminds you of it, whether it be through a human sword stabbed into the ground, or the silhouette of a deer grazing in a forest clearing. The general quality of the game extends beyond level design, too. The animation is equally superb, particularly on Quill herself. The way she reacts to the player’s own movements is almost eerily lifelike (for a game about a sentient mouse, anyway). Audio design is top-tier as well, from the gentle, flowing orchestral score to the eloquent narration of the game’s story. I particularly like how the narrator assumes the voices of the characters when they speak, as if the story was being told parent to child. There are a few issues. The game’s controls can be a little confusing, mainly because you’re effectively controlling two characters at once. When possessing an enemy, you move them by dragging them around with your left hand, which is the same hand you use to control Quill directly. In addition, some enemies wield a cannon-like weapon that you can shoot with the right analogue stick, which sounds cool but is extremely fiddly to control. It’s also worth noting that Moss is very short, between three and five hours depending on how keen you are to finish it. This isn’t really a flaw, because the game achieves exactly what it wants to, but it is something worth considering when parting with your cash. More of an issue is that the game can feel quite fragmented. Each time you move between screens, there’s a delay as the environment fades out and is replaced by the new area. The game also frequently cuts away from the main action for cutscenes in the form of a storybook that you turn the pages of. This is a neat gimmick at first, but as the game went on I was eager to get on with the action, and found these parts distracting from the experience rather than adding to it. 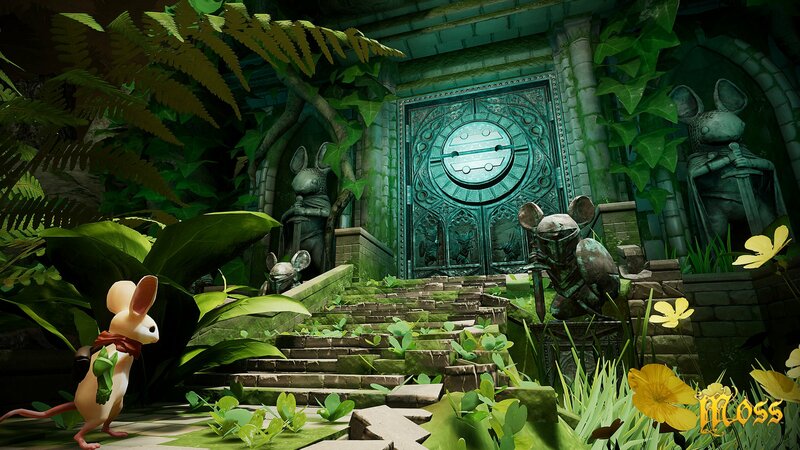 Mostly though, I found Moss to be thoroughly enchanting, a delightful little experiment that highlights the potential of VR gaming beyond simulators and first-person action games. The way it uses the unique perspective of VR to build a bond with another character is beautifully executed, and the way it presents a world that is small and yet huge at the same time, is like nothing else in gaming. Heartily recommended.